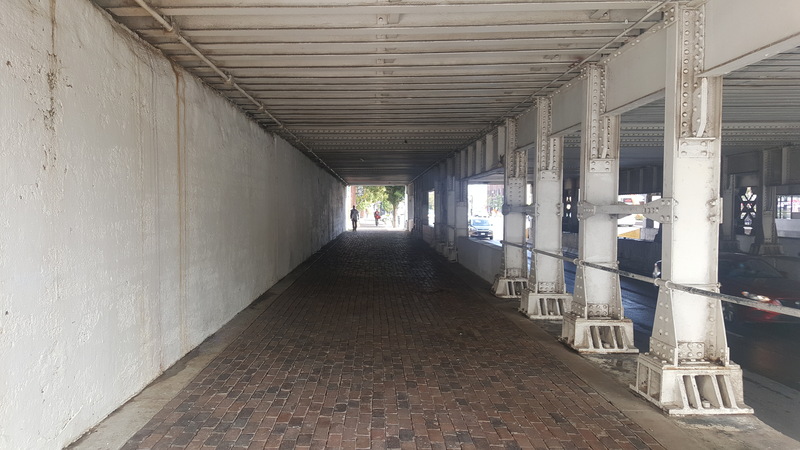 When people are asked about the Douglas Ave. underpass, just west of Union Station, most of them give the same description Matt Riedl of the Wichita Eagle gave, “It’s musty, dark, and populated primarily by pigeons (and their poop)”. It’s a space that could be generously described as sketchy, and one that should be actively avoided, lest you wish to be used as target practice for a territorial pigeon. 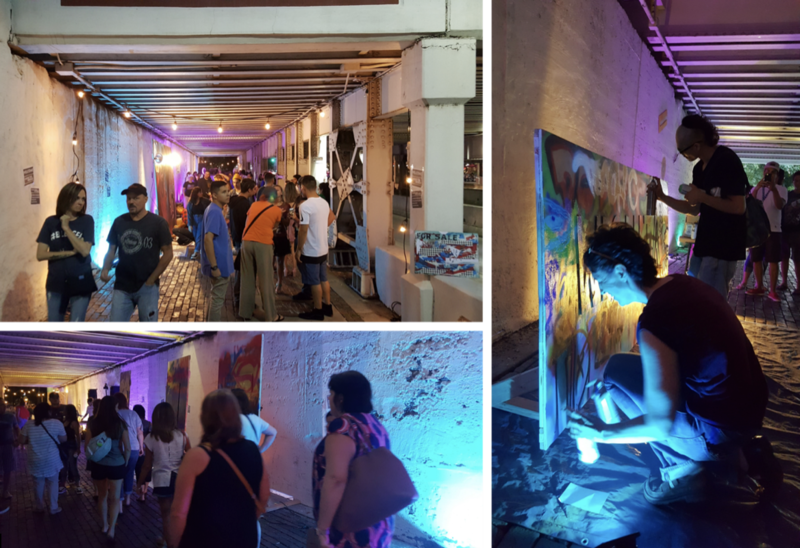 And yet, this was the very space that a group of artists and cultural producers from the North End Urban Arts Festival, Yellowbrick Street Team, and the League of Creative Interventionist Wichita Chapter wanted to pack with people, light and art. The basic premise of the project was to take a location that was avoided, and through the temporary installation of art and light, transform a negatively valued place to an area that people actively sought to be; creating a positive association with the Douglas Ave. underpass, and setting the stage for discussions when permanent renovation work begins. The project sought to bring into focus the strong urban arts scene that exists in Wichita, showcasing street art, created by artists of color, not often featured in established downtown art galleries. The project saw the side-eyed view that the underpass and street art share, and sought to transform the community’s perceptions. The goals were rather daunting, given the space chosen and its firmly established reputation; but through the installation of lighting, graffiti panels, and engaging the public with participatory painting, the task was not impossible. The first challenge was to brighten up the underpass as it’s a dark space, even on the brightest of days. 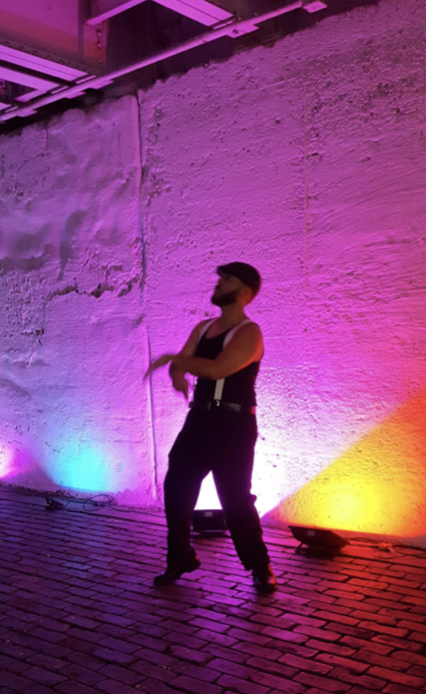 More than two dozen color-changing LED flood lights were brought in, not just to provide light, but to provide a powerful burst of color; inverting what was dark and dingy into bright and colorful. DJ’s filled the space with music, which aided in scaring away the pigeons, and provided the beats for more than one impromptu dance contest. The most important aspect to bring, however, was the art. Each month, a new street artist was commissioned to create a new work on plywood panels constructed into a massive canvas measuring 8’x12’. 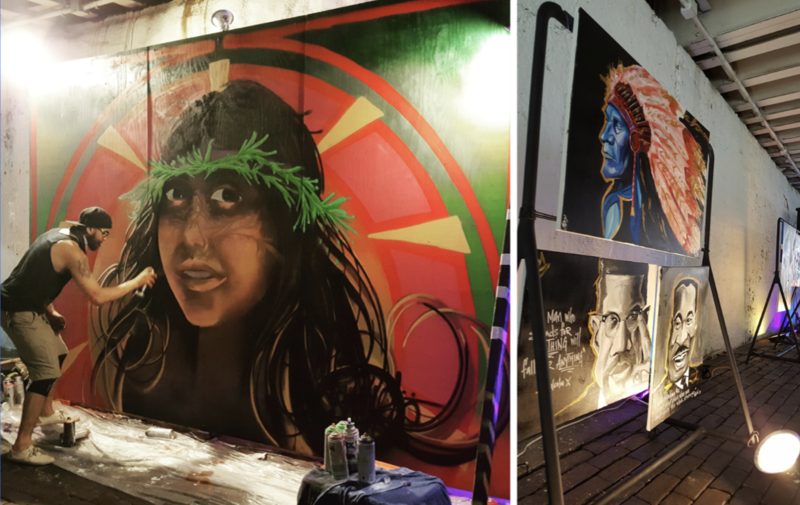 The artists finished each of their pieces during the event, showcasing their skills as artists, and interacting with onlookers. In addition, other artists brought collections of smaller pieces to display and sell to gallery attendees. While high attendance was desired, it was important to have people who came through to be more than just spectators. And with a gallery primarily focused on displaying street art, what better way to get people involved than to set up blank panels for attendees to try out their own graffiti skills. Armed with spray paint and their imagination, attendees were given the freedom to paint whatever they liked. So, what was the result? Was the Douglas Ave underpass able to be transformed? The underpass was packed with people, and more importantly, those people were coming in and staying for a bit. They spray painted on the participatory panels, browsed through the art collections brought in for sale, and watched as the artists worked on their panels. There was no doubt that through the influx of light, music, and art, the Douglas Ave underpass was transformed. It went from a place that was avoided or passed through as quickly as possible, to a spot that was actively sought out, lingered in, and appreciated. 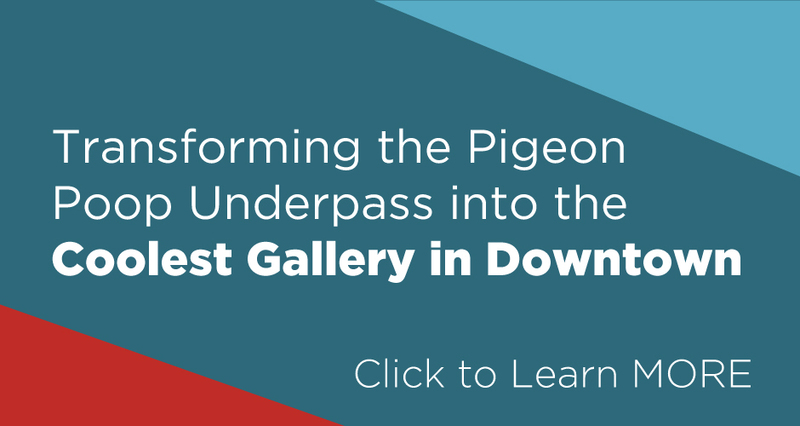 The pigeon poop underpass became one of the coolest galleries in Downtown.